With his pre-trial successfully behind him, Ash is finally ready to take the Ula’ula Island grand trial against Kahuna Nanu. Our hero is taken aback when Nanu reveals the terms of the challenge, though—Ash must defeat three of Nanu’s Pokémon with only one of his own! 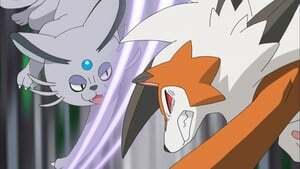 Ash decides that Lycanroc is up to the task, but the temperamental Pokémon might have trouble keeping its anger under control…especially when Nanu unleashes a barrage of taunts questioning Ash and Lycanroc’s teamwork.